IN ADDITION TO THE PERSONAL RELIGIOUS SIGNIFICANCE EACH OF US HAS TO CHRISTMAS, this holiday is also about traditions, symbols and, most of all, memories. These short descriptions of the origins of many of the factors that shape our holiday festivities will, no doubt, evoke thoughts on how each has woven a personal thread in our lives. Enjoy your memories. IN ANCIENT ROME, PEOPLE USED DECORATIVE WREATHS* as a sign of victory. Greens twisted into a circle made crowns for kings, military leaders, and athletes. Though wreaths were well-known throughout the ancient world, it appears that the people of Northern Europe were the first to specifically associate them with the winter season. For a region that experienced long hours of darkness and cold, wreaths must have brought a sense of hope into the home and represented life in the dead of winter. Even as Northern Europeans converted to Christianity, wreaths continued to decorate their homes during the winter season. The wreath was initially created from fresh evergreens, the obvious choice during the winter months. With time, these wreaths became distinctly Christian in their symbolism. Due to their circular shape, wreaths symbolized eternity, the circle of life, and endless hope. Since the wreaths were made of evergreens—trees that survived the “death” of winter—they also symbolized both the immortality of God and the souls of men. The origins of the Advent wreath are found in the folk practices of the pre-Christian Germanic peoples who, during the cold December darkness of Eastern Europe, gathered wreaths of evergreen and lighted fires as signs of hope in a coming spring and renewed light. Christians kept this popular tradition alive, and by the 16th century Catholics and Protestants throughout Germany used wreaths to celebrate Advent. From Germany the use of the Advent wreath spread to other parts of the Christian world. 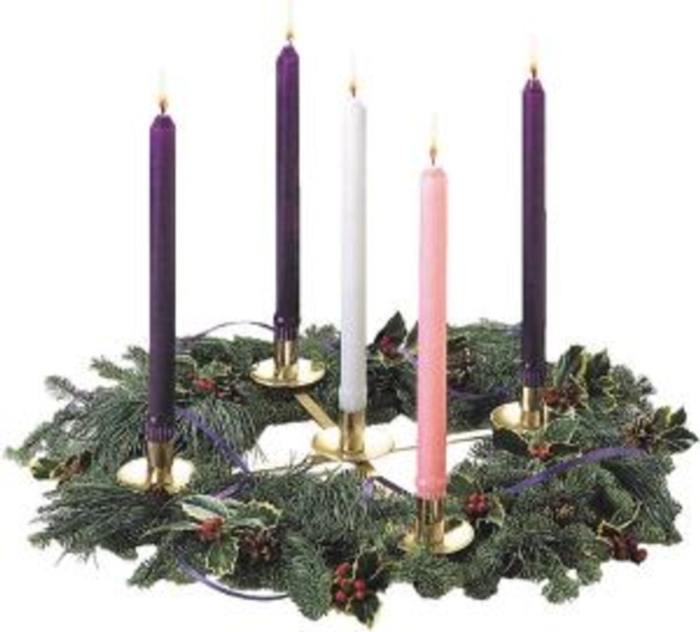 Traditionally, the Advent wreath is made of four candles in a circle of evergreens with a fifth candle in the middle. Due to the danger lit candles represented, the wreath is usually placed lying flat on tables or hung parallel to the floor. Each day, the candles are lit—one candle the first week, and then another each succeeding week. A short prayer may accompany the lighting of each candle. The last candle to be lit is the middle candle which takes place on Christmas Eve. Christmas wreaths, as opposed to Advent wreaths, have become more widely used as they contained no real candles and can be hung anywhere. Some people even choose to leave their wreaths up all winter. When they do take them down, it is usually a sign of winter's end and the anticipation of spring. 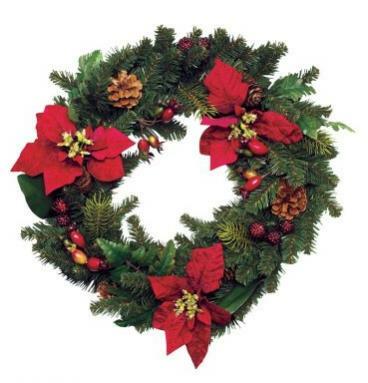 *The word wreath comes from an old English word, meaning to writhe or twist such as in a circle. WASSAILING IS AN ANCIENT CUSTOM that has undergone many changes over the centuries. Its main idea, however, has remained the same: a celebration with a cup of good cheer and a toast to good health. In other words, it is, first and foremost, a salute. Another tale about the origin of wassailing, not half as colorful, dates back to pre-Christian times when farmers in England’s apple-growing region would gather to shout and pour cider on their trees to ward off evil spirits. By “wassailing” their crops in the winter, it ensured a healthy crop in the spring. As Christianity spread, this ritual evolved further to drinking with song to the health of next season’s crops on Twelfth Night, the last night of the traditional Christmas season. By the 14th century, the tradition calmed considerately, and wassailing had a firm foothold in England’s Christmas traditions. Crowds of carolers would visit neighbors rather than their masters and carry with them a large wassailing bowl filled with a spiced punch of mulled wine or ale, nutmeg, and sugar. People would dip toasted bread into the mixture to soak up the flavor and share in the merriment. Special bowls for wassailing were made for these celebrations. They were large vessels crafted of wood, pottery, or tin with many handles for shared drinking and highly decorated lids. A large spoon was used to pour the beverage into the cups. Bowls like these became today’s punch bowls. During the 17th century the liquid inside the bowl took center stage. 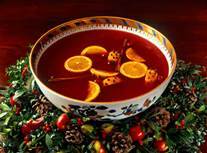 The rich punch-like drink of choice was called Lambswool, which consisted of warm ale or mulled wine, sugar, nutmeg, eggs, toasts, and “crabs.” Crabs were steaming, roasted crab apples dropped still-hot into the warm punch. They would burst upon impact and make a hissing sound as the mixture frothed and bubbled. The crabs gave the punch a tart sweetness and added a bit of drama. Over the centuries, a great deal of ceremony developed around the custom of drinking wassail. The bowl was carried into a room with a great fanfare; a traditional carol about the drink was sung; and finally, the steaming hot beverage was served. TURNS OUT, THAT COLOR SCHEME HAS BEEN ASSSOCIATED WITH WINTER HOLIDAYS FOR CENTURIES. Every major holiday has its classic color scheme. Halloween decorations are generally orange and black. Valentine’s Day is known for its reds, whites, and pinks. And every year around Christmas, the world sparkles with red and green hues. Society has long associated Christmas with this classic color combo. We’ve accepted green and red as the most festive way to decorate cookies and homes, as long as you don’t go overboard. Yet we do so without any inkling of doubt. Sure, red and green make a lovely pair, but how did they become the official colors of Christmas? It actually started centuries ago, when the colors were used to commemorate a different holiday. Ancient Celtic peoples revered red- and green-colored holly plants for being evergreen and believed holly was meant to keep Earth beautiful during the dead of winter. So when they and other cultures celebrated the winter solstice, they decorated their homes with holly to bring protection and good luck to their families in the coming year. The tradition of pairing red and green dates continued into the 14th century, when the colors were used to paint medieval rood screens, which were partitions installed in churches to separate the congregation from the priest and the altar. Dr. Spike Bucklow, a research scientist at the University of Cambridge, speculates that this physical boundary could have influenced Victorians to associate the colors with a different boundary, marking the end of the old year and the beginning of a new one at Christmas. Despite these meaningful religious traditions, there’s one person we should thank for confirming red and green as Christmas colors: Haddon Sundblom. Never heard of him? He’s the guy that Coca-Cola hired to draw a Santa Claus for the company’s ads. Until that point, artistic renditions of Santa were never consistent. He was usually a thin-looking guy, and his robes varied between blue, green, and red. 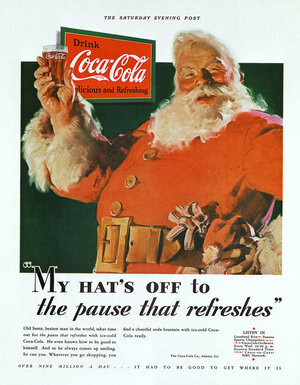 Sundblom chose to make him fat and jolly, wearing red robes (and, interestingly enough, the same color as the Coke logo). As Arielle Eckstut, co-author of Secret Language of Color, told National Public Radio, that creative decision made all the difference. Of course, the ads grew in popularity, and people came to know Sundblom’s Santa as “the real one.” “It solidified in our collective imaginations the red of Santa’s robes with the green of fir trees and holly and poinsettia that we already had in our minds,” she said. It seems that the history of how red and green came to symbolize Christmas is a lot like the holiday itself: rooted in religious tradition, modernized by commercialism, and continued by spirits of joy and good cheer. Think about that the next time you see lights blinking bright red and green. The custom of attaching special stickers to mail began in Denmark in 1903 when Einar Holboell, a Danish postman, was sorting piles of Christmas mail in a Copenhagen post office. It occurred to him that if every Christmas letter or parcel could carry an extra stamp, the cost of that stamp could go to charity. He realized that this simple idea could potentially raise large sums for little cost. Holboell explained his idea to his colleagues who were as enthusiastic as he was; but unfortunately, there was not enough time to put the idea into action. The plan was not forgotten; and in the following year the postal workers worked on a design and financial projections to present to King Christian IX of Denmark. He gave the idea his “seal of approval” and suggested that that the first issue of Christmas seals should carry a picture of Queen Louise as a sign that he and his wife fully endorsed the idea. The Christmas seals were launched in time for Xmas of 1904, and the campaign was even more successful than the postmen had hoped. Four million seals were sold in Denmark. The funds raised from the sales of Christmas Seals in both 1904 and 1905 were donated to charities for children and also to charities that helped people with tuberculosis (TB), a greatly feared disease of the time. Two hospitals for treatment of tuberculosis were built due to these charitable donations from ordinary citizens. The custom of selling Christmas Seals quickly spread to other European countries and in 1907 reached North America. Dr. Joseph P. Wales desperately needed funds for his TB patients and asked his cousin Emily Bissell to help to raise the money. Emily Bissell remembered a magazine article which told how the Danish people were fighting tuberculosis by buying Christmas Seals, and she caught the imagination of a local newspaper and with the slogan: Stamp out tuberculosis! By 1908, Bissell's idea grew to a nationwide program administered by the National Association for the Study and Prevention of Tuberculosis (NASPT) and the American National Red Cross. The seals were sold in post office lobbies at 1 cent each. 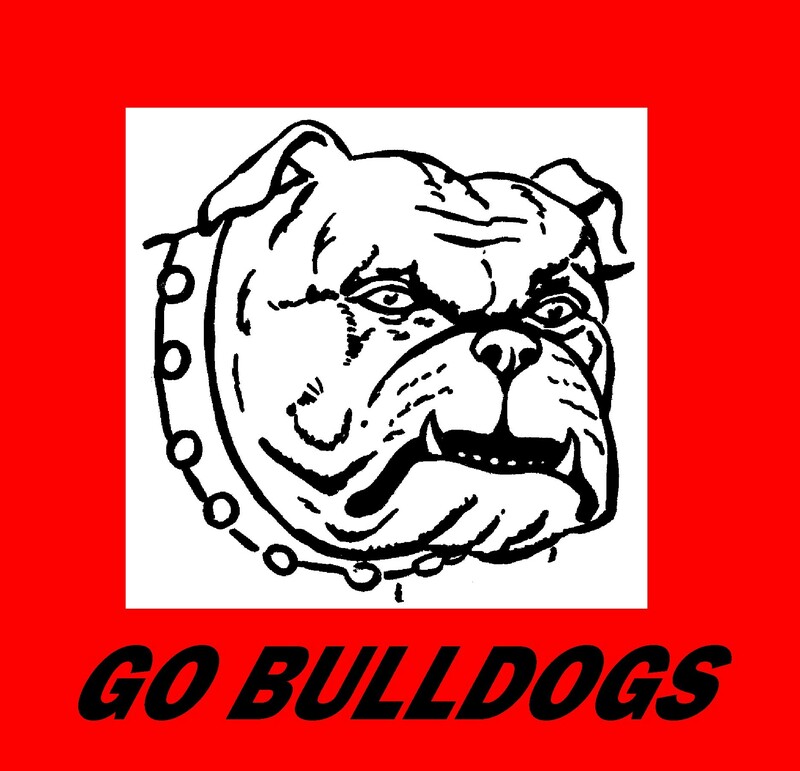 Net proceeds from the sales were divided equally between the two organizations. By 1920, the Red Cross withdrew from the arrangement, and sales were conducted exclusively by the NASPT, then known as the National Tuberculosis Association (NTA). After WorId War II with the development of the antibiotic streptomycin, TB became a curable disease, although it would be decades before it could be considered under control in developed countries. To reflect the expanding scope of the organization's goals, the name was changed to the National Tuberculosis and Respiratory Disease Association in the late 1960s. The NTRDA became the American Lung Association in 1973. Today the Christmas seals benefit the American Lung Association and other lung related issues. Tuberculosis was declining, but recently has been on the rise. TB is still one of the most common major infectious diseases in the world. TRADITIIONAL CHRISTMAS EVE LUMINARIAS OR FAROLITOS (LANTERNS) ARE SAID TO HAVE ORGINATD WITH SPANISH TRADERS who were impressed with the papr lanterns of the Chinese and decided to create their own version when they returned to the New World. They were first seen in what became the American Southwest as glowing paper sacks lining walkways and driveways to guide the spirit of the Christ child to their Catholic homes. Today, they are a more secular decoration. The original hand-made luminarias are simply done with brown paper lunch bags filled with a few inches of sand (or kitty litter) to weigh them down and support the votive candle inside. In some cases snowflakes or trees shapes are first cut out into the bags. When lit, the candle gives off a golden glow through the bag. The bags are then be arranged in rows or along yards, fences, sidewalks, roofs, and driveways to create as large and elaborate displays as desired. Electrically-lit luminarias are also used. Strings of artificial luminarias, with plastic bags illuminated by small light bulbs and connected by an electrical cord, are becoming common and are typically displayed throughout the year-end holiday season. In West Vally City, Utah, luminarias are used to light the path during the “Walk with Santa” held the first Monday of December every year. The display features over 300 luminarias. The American Cancer Socieety's “Relay for Life” fundraising events which are held all over the U.S. feature luminaria ceremonies. Luminarias are placed around the track, and some relay events spell out HOPE with luminarias in stadium stands. After the 2008 city hall shooting in Kirkwood, Misouri, residents lined the streets with luminarias to honor the victims. The American Foundation for Suicide Prevention's “Out of the Darkness Overnight” uses luminarias at the end of the overnight walk to memorialize those lost to suicide for survivors. 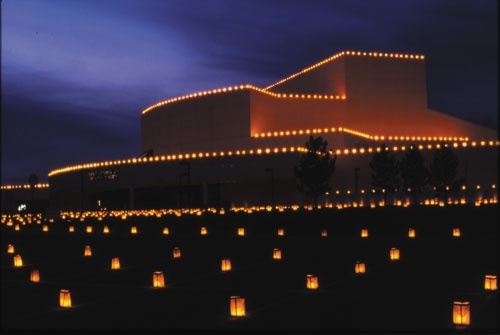 San Juan College in Farmington, New Mexico, organizes a large annual luminaria display, most recently consisting of around 30,000 luminarias. Luminarias have also become popular in some cities of California. The Boy Scout Troops and Albuquerque Youth Symphony sell them around Christmas time as a form of fundraising. In Galena, Illinois luminarias line the streets of the town one night in December for their annual "Night of Luminaria." Each of the past 22 years, Seattle’s community members have placed as many as 1800 luminaria along three miles of a path beside Lake Washington north of Seward Park. The luminaria display coincides with the annual Christmas Ships’ Festival organized by Argosy Cruises. In Midlothian, Illinois luminaria sets are sold to raise money for the local food pantries. The sale accounts for about 75% of the pantries annual budget. TRADITIONALLY, AN ORNAMENTAL PICKLE IS HIDDEN ON A CHRISTMAS TREE AS ONE OF THE CHRISTMAS DECORATIONS. On Christmas morning, the first child to find the pickle receives an extra present from Santa Claus or is promised a year of good fortune. 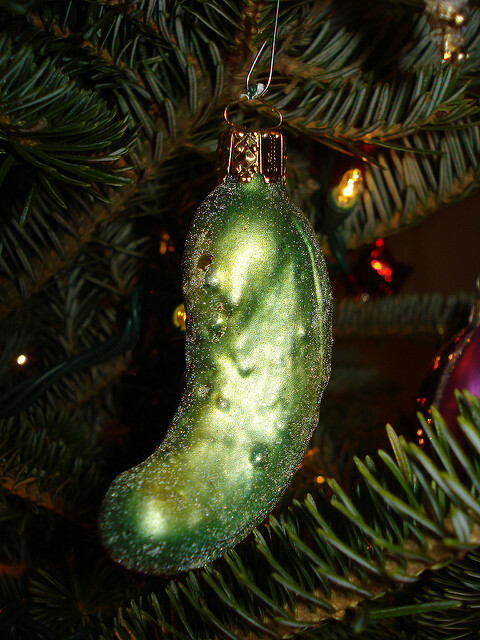 The Christmas pickle was thought to be a German tradition in the United States and was referred to as a Weihnachtsgurke. However, the claim that it began in Germany seems to be a total myth! Not many people in Germany have even heard of the Christmas Pickle! The true origin of the Christmas pickle is now thought to be have been developed for marketing purposes in the early 1890s to coincide with the importation of glass blown ornaments from Germany and France. Woolworths was the first company to import these tree decorations, which were often in the shape of fruits and vegetables. It is suspected the pickle was one of these shapes. 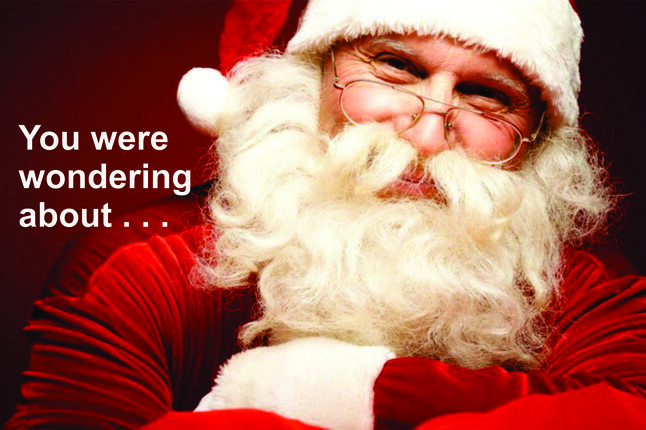 The final story is linked to St. Nicholas and originates from Berrien Springs, Michigan. It's a Victorian era tale of two Spanish boys traveling home from boarding school for the holidays. When they stopped at an inn for the night, the evil innkeeper killed the boys and put them in a pickle barrel. That evening, St. Nicholas stopped at the same inn, found the boys in the barrel, and miraculously bought them back to life. History, however, records a second old legend about St. Nicholas rescuing boys from a barrel, but this barrel originally held meat for pies—not pickles. So, the question arises: Were the stories confused or was St. Nick obsessed with checking barrels? Berrien Springs sits in the area of Michigan known for cucumber production and is known as the Christmas Pickle Capital of the World. A annual pickle festival, including a parade, was held there until recently. 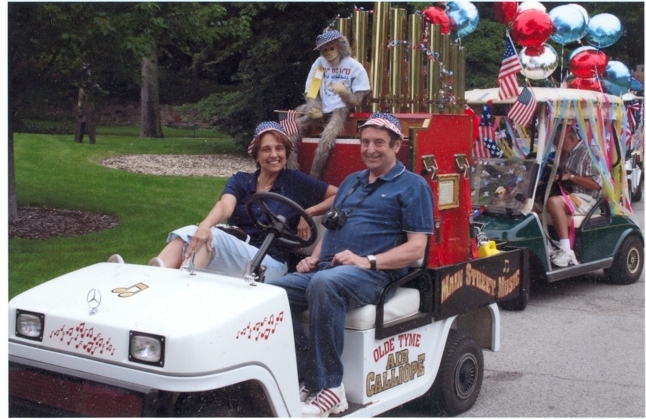 Bruce and I with our calliope won a large trophy for the Most Novel entry both times we entered the parade. BOTH THE ANCIENTS AND THE CHRISTIANS used bells for several purposes. They were rung to call people to temples and churches, to tell the time, and to announce the beginning of military actions. In some places the sound of the bells accompanied the convicted to the scaffold, informed the inhabitants about a fire, or death of a monarch, a bishop, or even a private person. Bells, especially church bells, have traditionally been associated with Christmas for a long time. During Christmas in some churches in the United Kingdom, the largest bell in the church is rung four times in the hour before midnight and then at midnight all the bells are rung in celebration. A lot of Churches have midnight services on Christmas Eve. In the Anglican and Catholic churches, the church day starts at sunset, so any service after that is the first service of the day. So a service on Christmas Eve after sunset is traditionally the first service of Christmas day! In churches that have a bell or bells, they are often rung to signal the start of this service. In Victorian times, it was very fashionable to go carol singing with small hand bells to play the tune of the carol. Sometimes there would only be the bells and no singing! Hand bell ringing is still popular today. 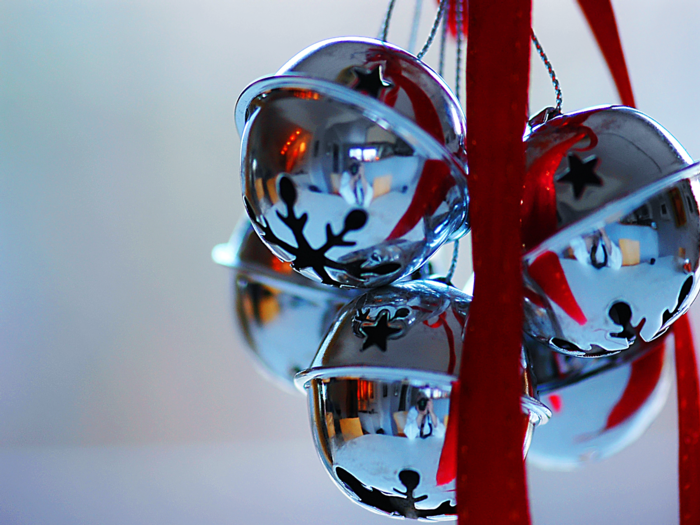 Smaller bells are also associated with Christmas, especially sleigh bells, or jingle bells. Jingle bells are typically used as a cheaper alternative to small classic bells and are commonly used on Christmas decorations, ornaments, and many Christmas card illustrations. Jingle bells are probably our most memorable bells for they were proclaimed, loudly and clearly, in our 40-50s voices as soon as we could talk and, sort of, carry a tune. Below is a nostalgic reminder with a slight twist. MEAT HAS ALWAYS BEEN FEATURED AT THE TRADITIONAL CHRISTMAS FEAST, although it is has not always been in the form of turkey as it is today. The act of serving a large roasted joint of meat at Christmas is believed to have originated from ancient sacrificial rites to appease the gods and hopefully to ensure a sufficient harvest in the following year. The original tradition was to have boar or pig. The custom goes back to Norse folklore where boar was served in Valhalla, the mythical hall where Odin received the souls of heroes who had fallen in battle. The Celts continued this practice (as well as supplied pork and bacon throughout Europe) and made it more popular than beef or mutton for celebrations. In England, hunting the Christmas boar became an annual sport. After proper preparation, the boar's head would be brought into the dining hall—often depicted with an apple in its mouth—with great ceremony. King James I can be thanked for the emergence of turkey as he introduced it during the seventeenth century for the important reason that it was far kinder to his delicate digestive system! Of course not everyone could afford it, and the poor had to make do with goose. THE THREE WISE MEN, OR MAGI, presented the infant Jesus with gold, frankincense, and myrrh - three gifts which were fit for a king. We all know what the value of gold would be as a gift, but what about the other choices? With their unfamiliar names, today’s readers may wonder why they were considered a worthy present. So . . .
Frankincense is the gum-resin, or sap, obtained from certain species of trees of the genus Boswellia, which grew in Arabia, India, and Ethiopia. 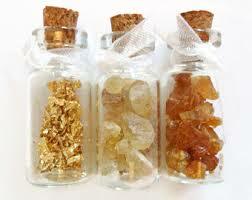 It was valued not only for its sweet odor—perfume—but it could be burned instead of oil for light. Frankincense also produced a fine white smoke and was often burned on ceremonial altars as offerings in various religions. Myrrh is the gum-resin, or sap, primarily obtained from the Commifera Myrrha, or the Dindin tree, in addition to other species of trees found in Yemen, Somalia, the eastern parts of Ethiopia, and Jordan. When the reddish-brown resinous juice has hardened, it is made into ointments or perfumes; or it is ground into a powder. Myrrh was highly valued for its use in embalming, or anointing of the dead, because it postponed decay and alleviated the odors of the deceased. It also was used as an expensive perfume. As a medicine, the Romans used it as an antidote to hemlock, tumors, cancer, and leprosy. In the East, myrrh was believed to hold anti-inflammatory and antiseptic properties and used as an external application for infections, boils, and sores. 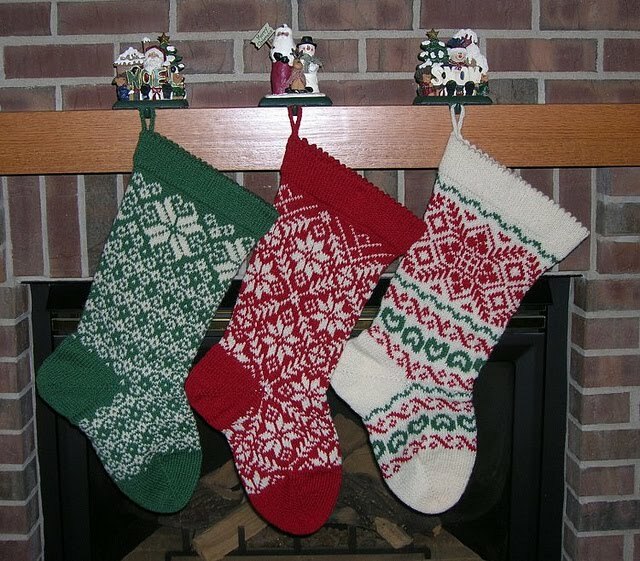 STOCKINGS HAVE BEEN AN ESSENTIAL PART OF THE CHRISTMAS TRADITION FOR CENTURIES (except, briefly, in the mid-1800s, when the New York Times wrote that Christmas trees almost completely supplanted them as the tradition of choice). The most popular legend about why stockings are hung at Christmas goes something like this: A recently widowed man and father of three girls was having a tough time making ends meet. Even though his daughters were beautiful, he worried that their impoverished status would make it impossible for them to marry. St. Nicholas was wandering through the town where the man lived and heard villagers discussing that family’s plight. He wanted to help but knew the man would refuse any kind of charity directly. Instead, one night, he slid down the chimney of the family’s house and filled the girls’ recently laundered stockings, which happened to be drying by the fire, with gold coins. And then he disappeared. The girls awoke in the morning, overjoyed upon discovering the bounty. Because of St. Nick’s generosity, the daughters were now eligible to wed and their father could rest easy that they wouldn’t fall into lonely despair. Whew! While obviously far-fetched, this tale of unknown origin and date is most widely referenced when it comes to the history of the Christmas stocking. For some, the ritual has translated into hanging a nondescript sock (the bigger, the better, of course) pulled from Dad’s drawer. For others, it has meant a personalized, decorated, maybe even handmade, foot-shaped bag hung year after year. And sometimes, it means not hanging the stocking by a fireplace at all! Whichever stocking set-up you prefer, there’s one more related factoid that’ll impress guests during your holiday party. Oranges tend to wind up in Christmas stockings, right? Ever wonder why? Some say it’s from a time when fresh fruit was more difficult to come by and finding an orange in your stocking was a huge treat. But a different version of that beautiful-daughters-distraught-father legend swaps the gold coins left by St. Nick with three gold balls left in each stocking. Understandably, the solid gold balls tradition isn’t so easy to replicate; that’s why their citrus look-alikes have found their way into stockings alongside candy and baubles, but hopefully not coal! YEARS AGO AT CHRISTMASTIME, PEOPLE IN ENGLAND WOULD SEND LETTERS TO FRIENDS AND FAMILY FAR AWAY, and children at boarding school would decorate paper and write letters to show off the writing skills they’d improved upon that term at school. It wasn't until 1843, however, that the first official Christmas card was created by Sir Henry Cole, director of London's Victoria and Albert Museum. Sir Henry came up with the idea of Christmas Cards with his friend John Horsley, who was an artist. They designed the first card and sold them for 1 shilling each - about 8 cents today - but in those days, it was worth much more. The card had three panels. The outer two panels showed people caring for the poor, and in the center panel was a family having a large Christmas dinner. About 1000 were printed and sold. They are now very rare and cost thousands of dollars to buy. 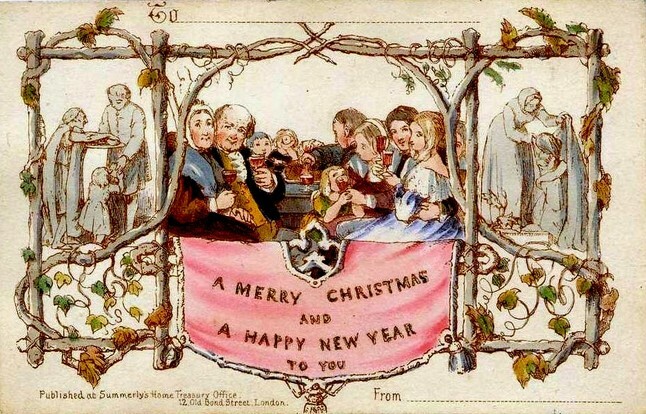 About 1860, when printing methods improved, Christmas cards became more popular and were produced in large numbers. These first cards usually had pictures of the Nativity scene on them; and in late Victorian times, robins and snow-scenes became common. By 1870 the cost of sending a Christmas card dropped to a half a penny, which meant more people than ever before were able to send cards. Lithographer Louis Prang, a Prussian immigrant who started a small printing business near Boston in the late 1850s, is generally considered the father of the American Christmas card. Prang published his first card - a simple flower design with the words “Merry Christmas” - for his American customers in 1875. Nowadays, cards have all sorts of pictures on them: jokes, winter pictures, Santa Claus, or romantic scenes of life in past times. In more recent decades, the sending of physical Christmas cards has declined somewhat because of the widespread use of electronic mail (e-mail) through the Internet. Many people send “E-Greetings” or “E-Cards” which are electronic cards, sometimes with music and animation, sent via e-mail. However, many people still choose to send real Christmas cards, with close to 2 billion Christmas cards being sent each year in America alone. IN ITS MANY FORMS, NO CONFECTION SYMBOLIZES THE HOLIDAYS QUITE LIKE GINGERBREAD. There are cookies, elaborate edible houses, biscuits, candy-studded gingerbread people, and spiced loaves of cake-like bread which fill holiday tables and delight people of all ages. The name gingerbread is from the French word gingerbras - where the s is silent - which simply meant “preserved ginger.” When it was spoken in English, it sounded like gingerbread, which was how the term was derived. The word is now broadly used to describe any type of sweet treat that combines ginger with honey, treacle, or molasses. Ginger has been a trading commodity longer than most other spices. The Crusaders were responsible for its making its way across Europe to Britain. In addition to its use as a flavoring, it was highly valued for its medicinal qualities: a popular warming spice, a digestive aid, and a remedy for flatulence and colic. Even today, we use ginger to calm nausea and other stomach ailments. During the early Middle Ages, ginger’s strong flavor was employed to disguise the taste of preserved meats, but this practice changed over time. Queen Elizabeth I is credited for being the first to create gingerbread-shaped people. She would order her cooks to fashion out of gingerbread the actual likenesses of her important guests to honor their visits. Later, wooden molds were made to shape a stylized human body with stubby arms and legs; and icing was used to add eyes, a mouth, and buttons. By the late Middle Ages, most European countries were selling their own versions of hard gingerbread cookies shaped like animals or humans at their fairs. 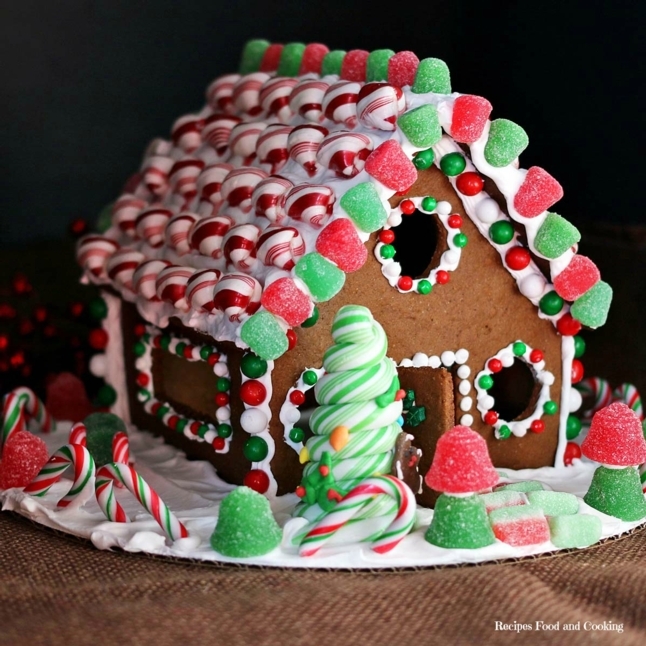 Gingerbread houses originated in Germany during the 16th Century. The popularity of these intricate cookie-walled houses rose when the Brothers Grimm wrote the story of Hansel and Gretel, in which the main characters stumble upon a house made entirely of treats deep in the forest. ". . . it was built of bread and covered with cakes, but that the windows were of clear sugar. 'We will set to work on that,' said Hansel, 'and have a good meal. I will eat a bit of the roof, and you Gretel, can eat some of the window, it will taste sweet.' "
It is unclear whether or not gingerbread houses were a result of the popular fairy tale, or vice versa. After the fairy tale was published in the 1800's, however, German bakers began baking houses of gingerbread and even employed artists and craftsmen to decorate them. REPORTS MAY SHOW THAT THE TRADITIONAL CHIRSTMAS PUDDING HAS FALLEN OUT OF FAVOR and lighter, healthier, desserts are now preferred. Also, reports may bemoan that in this busy world no one has time for its preparation. The pudding must be measured and mixed, marinated overnight and steamed for 7 hours. Then, it has to be stored in a cool, dry place; and on serving day it requires an additional hour of steaming. Well, the concern over Christmas pudding’s demise is just not so! The Christmas pudding - dense, moist, and oozing decadence of rich fruits and brandy- is still as essential to a British holiday meal as it ever was. The traditional pudding dessert dates back before the Middle Ages but has changed drastically over time. It had been a main dish consisting of beef and mutton with raisins, currants, prunes, wines, and spices. It had the consistency of soup and was eaten as a fasting meal in preparation for the Christmas festivities. Christmas pudding slowly changed into Plum Pudding about 1595. Dried plums and other dried fruits were added; it was thickened with eggs and breadcrumbs; and beer and spirits were included for more flavor. By 1650, the enhanced pudding became the customary Christmas dessert until it was banned by the Puritans in 1664 as a bad custom. Many interesting traditions have been attached to the preparing and eating of Christmas Puddings over the years. One superstition dictates that the pudding be made with 13 ingredients - no more, no less - to represent Jesus and His Disciples. 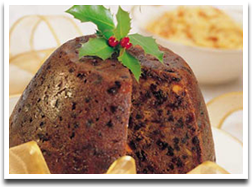 The pudding’s place at the end of the British Christmas dinner dates back to the Twelfth Night Cake which was eaten on the Twelfth Night of Christmas, the official end of the Christmas celebrations. About five weeks before Christmas, usually on the Sunday before Advent, the pudding is made. The day is sometimes referred to as Stir-up Sunday. This occasion brings the whole family together and each takes a turn to stir the mixture, make a wish, and add silver coins. Those who find those coins on Christmas day are assured of wealth, health, and happiness throughout the coming year. Stirring the pudding should be done with a wooden spoon and done in the direction east to west to honor of the Wise Men. A dried pea or bean was originally baked in the mixture and whoever found it was king or queen for the night. Records show that this practice dates back to the court of Edward II in the early 1300s. Brandy Butter, cream, or custard is served with the pudding. A fun and festive ritual is followed when serving the pudding as a dessert. The top of the pudding is doused with brandy and then set alight. The flaming pudding is paraded in front of the guests prior to being served. Should you wish to try your hand at Plum pudding but are concerned that you don’t have the time or patience to do so, we’ve found directions from Marguerite Patten, a popular British chef, for a short cut using the microwave. She promises that it is just as tasty as the traditional way. CRACKERS, A TRADITIONAL CHRISTMAS FAVORITE IN BRITAIN, were first made about 1845-1850 by a London candy maker called Tom Smith. He had seen the French Bon Bon sweets, almonds wrapped in pretty paper, and tried to copy and sell them in England. As a novelty, he included a small motto, or riddle, within the package; but his product didn't sell as well as he’d hoped. One night while sitting in front of his fireplace, he became fascinated by the sparks and crackles coming from the fire; and he suddenly had an idea. What fun it would be, if his sweets could be opened with a crack when their fancy wrappers were pulled off. Eventually, Tom perfected his idea by using friction to create a “pop” when the wrapping was broken; and the cracker was born. He dropped the sweet and the Bon Bon name, calling his new crackers Cosaques—perhaps after the Cossak soldiers who had a reputation for riding on their horses and firing guns into the air - but he kept the motto and added a surprise gift. The new product was wildly accepted. When Tom died, his expanding cracker business was operated by his three sons. They introduced paper hats into crackers and travelled the world looking for new ideas for gifts to put into them. 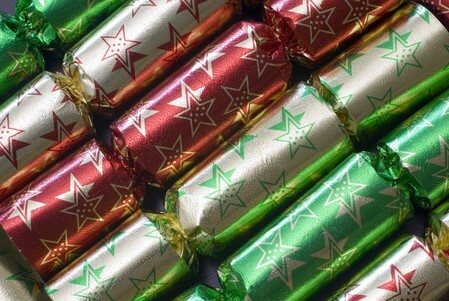 The Christmas Crackers that are used today are short cardboard tubes wrapped in colorful paper. There is normally a Cracker next to each plate on the Christmas dinner table. When the crackers are pulled - with a bang! - a colorful party hat, a toy or gift and a festive joke falls out! Crackers are easy to make. Should you wish to try, here’s a video to help. What do you get if Santa goes down the chimney when a fire is lit? What song do you sing at a snowman's birthday party? Freeze a jolly good fellow! What did the beaver say to the Christmas Tree? What do you get if you cross a bell with a skunk? Because they're not tall enough to be pilots! CANDY CANES ORIGINATED IN GERMANY over 250 years ago. They began as straight white sugar sticks, were refined over the years, and become so popular that they are now one of the most visible signs of the Christmas season. Like many facets of the holiday, this simple candy has an interesting story, or legend, behind it. The candy was given its distinctive J-shape, it is believed, by a rather desperate German choirmaster. During Christmas service, it is said, his children were usually very noisy and inattentive. One year, in anticipation of this disruptive behavior, he created a special distraction to ensure their silence: He gave each of them a long, white, sugar stick. The earliest historical record of candy canes, however, begins over 200 years after the choirmaster’s demise; and so while the story is rather nice, it probably isn't true. In 1847, the sweet white cane became more fashionable when a German-Swedish immigrant in Wooster, Ohio, who liked candy canes a lot, decided to string them on his Christmas tree as decorations. The idea soon caught on and spread in no time. By 1900, candy canes sported bright red stripes and were flavored with peppermint and cinnamon. Soon after those changes were made, they became the popular and tasty tradition they are today. For a little more info on this holiday favorite, click on the arrow below. POINSETTIA PLANTS ARE NATIVE TO CENTRAL AMERICA, especially the area of southern Mexico known as Taxo. They have large, conspicuous red vermilion bracts below the yellowish flowers. The petal-like bracts are modified leaves located at the junction of the flower stalks and main stem. In November and December these leaves turn vivid shades of red in response to the longer nights. The Poinsettia plant was introduced to United States in 1828 from Mexico by Joel Roberts Poinsett, who was the first U.S. Ambassador to Mexico. He was appointed to the position by President Andrew Jackson. Poinsett took cuttings from the poinsettia plant and brought them back to his greenhouse in South Carolina where he began growing the plants and sending them to friends and botanical gardens. By the early 1900's the poinsettia was marketed throughout the U.S.
Today, poinsettias may be found in many colors - red, pink, white, blue, to name a few - as well as many sizes, from mini to large specimen trees. Testifying to its success and popularity, the poinsettia is not only the most popular Christmas flower, it is the number one flowering potted plant in the United States. There was once a poor Mexican girl called Pepita who had no present to give the baby Jesus at the Christmas Eve Services. As she walked along the road to the chapel, Pepita picked a handful of pretty weeds and made them into a small bouquet. She still, however, felt sad and embarrassed because had such a small gift. Pepita’s cousin Pedro joined her journey and tried to comfort her when he learned the reason for her unhappiness. “Pepita,” he said, "I'm sure that even the smallest gift, given by someone who loves him, will make Jesus happy." Arriving at the chapel and feeling a little better due to Pedro’s assurances, Pepita knelt down and put the bouquet at the bottom of the nativity scene. Suddenly, the weeds burst into bright red flowers, and everyone who saw this were sure they had seen a miracle. From that day on, the brilliant flowers were known as the Flores de Noche Buena, or Flowers of the Holy Night, and they have been used to spread the wonder and joy of the Christmas season. 1. Keep the plant in a well-lit, sunny location. 2. Ensure the plant is in well-drained soil. 3. Shield the plant from any drafts. 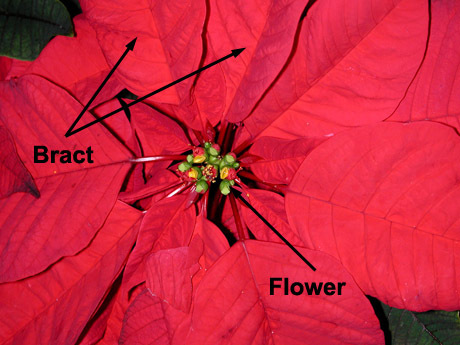 Exposure to drafts or a cold temperature will make the poinsettia drop its leaves. 4. Keep warm - approximately at 72°-75°F during the day and 65° F at night. 6. 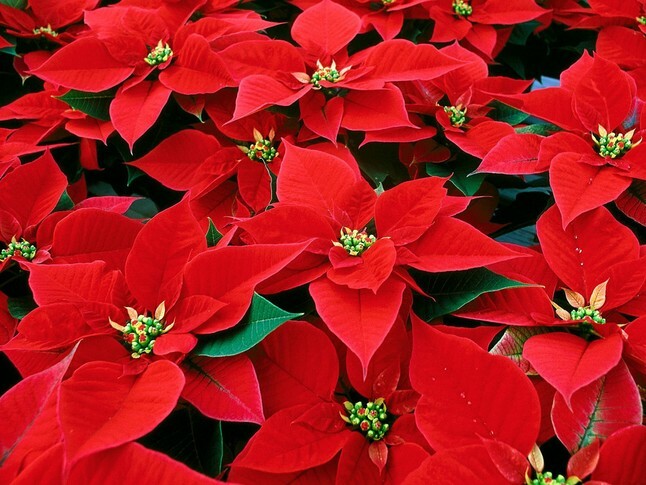 Fertilize the poinsettia if you keep it past the holiday season. 8. Coloring of the bracts and flowering is induced by shortening the amount of time the plants are exposed to light. From late September to early December, the plant should be kept in total darkness between 5 pm and 8 am. The largest end of the tree would be dragged into the home’s fire hearth while the rest of it stuck out into the room. The tree was lit from the remains of the previous year's log which had been carefully stored away - usually under the bed - and then the new log was slowly fed into the fire to warm the house through the Twelve Days of Christmas. Nowadays, of course, most people have central heating so it is unnecessary and very difficult to burn a tree in the house. The tradition, therefore, has changed dramatically. Urban areas like New York City have high-density populations, with space at a minimum; so fireplaces are a rare commodity in apartments and condominiums. In 1966, New York City television programming director Fred Thrower had an idea for log-deprived New Yorkers who longed for the “good old days.” Thrower had his local station, WPIX-TV, broadcast a looping video of a blazing fireplace - with Christmas music playing in the background - beginning on Christmas Eve. The broadcast, designed to provide city-dwellers with holiday ambience they might otherwise lack, was an instant success and became a Christmas morning mainstay. It began airing on national cable networks, and in high-definition, in 2004. While a proper yule log isn't a common sight in any 21 st-century fireplace, it can be found in holiday kitchens. Buche de Noel, a wonderful French dessert, is a sponge cake replica of a yule log. It comes in flavors like chocolate and gingerbread and is frosted in a wood-grain pattern. It's believed that the dessert was created in response to French families who didn't have a fireplace for a real yule log in their homes but desired to share in the holiday tradition. 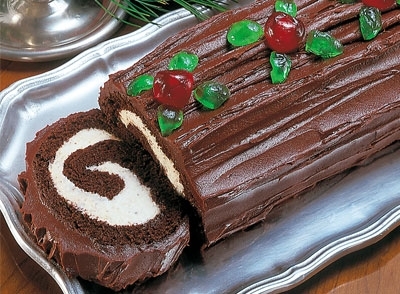 Today, Yule log cakes are readily available in bakeries throughout Europe as well as those in the United States. This solution for continuing the tradition of the Christmas Yule Log in the absence of a fireplace - or even with a fireplace - seems like a wonderful option, and it certainly qualifies as a more delicious one!